WITH just four hours to go before it was time to light the candles and kick-start one of Lyme’s most impressive attractions, it was lashing down with rain. There were few who thought it would be possible to stage the hugely popular and emotional Candles On The Cobb event. The brainchild of innovative fundraisers Phil Street and Mike Higgs, the staging of this impressive spectacle was revived and taken over by the Rotary Club of Lyme Regis with 50 per cent of proceeds going to the Royal British Legion’s poppy fund, as this year sees the 100th anniversary of the end of the First World War. The weather forecast was awful but the forecasters did say the rain would stop and the clouds would lift early evening. And for once they were right. Rotary organisers were under pressure as the day progressed to call the event off and to re-stage at a later date. But they steadfastly refused to do so – and that was the right decision. It was not possible to position the candles on the high wall because the sea was still washing over the Cobb as the task of lighting 5,000 candles began. But it was still a hugely impressive showing – especially for the many who were seeing it for the first time, some having travelled many miles. Having organised a number of big events in Lyme over the years, I’ve always been a believer in going to the wire when it comes to dealing with inclement weather. I remember only too well when I was secretary of the regatta and carnival. For the first four years it rained almost constantly through the week of events and I started to think I was jinxed. And so did some of the other committee members! But for the next six years we had glorious weather and we built it into one of the biggest events of its kind on the south coast. Another man used to taking whatever weather comes his way is the current regatta secretary Alan Vian, who has done the job for 15 years and has endured many soakings. And whilst talking about Alan, the voice of Lyme, I thought his commentary for Candles On The Cobb was spot on. Having compered all the other Candles On The Cobb events, I know how difficult a job it is. The words he carefully chose just before the period of silence, which the crowd respected, were brilliantly scripted. Well done to all the members of Rotary and their helpers for having the guts to take it on and for sticking to the old adage – “the show must go on”. BELATED congratulations to one of Lyme’s most popular landladies. Margaret Vincent, wife of Jack Vincent, who ran the Pilot Boat, one of the town’s most frequented hostelries (at least by me) for many years, recently celebrated her 90th year. When I was growing up Lyme had 11 pubs and we all had our favourites. Mine was definitely the Pilot Boat where, in his early days in Lyme, Jack also ran a garage at the back, converted to the Inn Plaice function suite when Bill and Caroline Wiscombe took over the pub. Margaret was the epitome of the glamorous pub landlady. Most nights she would make an entrance – and I mean an entrance – in the lounge bar (back bar to us locals), at around 9pm, immaculate make-up and dressed to the nines. This was in the days of the pub lock-in and Jack would ensure that non-locals emptied their glasses by 11.10pm and all the locals were ushered into the back bar where the real fun would begin. Nobody expected to leave before 2am and I can remember on one occasion leaving the Pilot with another regular, John Lloyd, at five in the morning! Although Jack detested juke boxes, Margaret loved to dance and would take a twirl with all us regulars. Jack and Margaret were big supporters of the regatta and carnival during my years as secretary and always put great effort into the fancy dress nights that were staged in all the pubs. Invariably they won the cup for the best decorated bar. There were two other permanent fixtures at the Pilot – pot man F-F-Fred and Jack and Margaret’s much loved dog Azul. Things occasionally got out of hand, especially if Axminster farmer Martin Bright was in town. He would invariably strip down to his underpants and run from the Pilot Boat to Cobb Gate and back just for the hell of it, his modesty often protected by two dinner plates, back and font. Jack and Margaret would often take a winter break to Majorca and I joined them on a couple of occasions. On one late night in Palma I can remember we all winced when Margaret grabbed an armed policeman in the street and started dancing with him. PLANS are well in hand to commemorate the 100th anniversary of the end of the First World War in Lyme Regis with the high point being a visit to the town on September 22 by The Rifles regiment, the successor to the Devon & Dorsets. Lyme Regis was the first town in Dorset to grant the Freedom of the Borough to the old Dorset regiment towards the end of the last war in 1944 and The Rifles will exercise their right to march through the town with fixed bayonets. The Rifles will take part in a ceremony to rededicate the war memorial in George’s Square, which has been updated with names of those with local connections who gave their lives in the two world wars which were left off the original memorial. Lyme Regis Town Council has met the bill for this work to be carried out and the Mayor, Councillor Michaela Ellis, will host a reception for the regiment and civic guests at the Woodmead Halls afterwards. Research to ensure all those from Lyme who made the supreme sacrifice are included on the war memorial has been carried out by Royal British Legion members Vernon Rattenbury and David Humphrey, who both served in the Royal Navy. The new-look memorial will be unveiled by Sandra Jones, the daughter of Flying Officer Hay, whose name was omitted from the original. Other events are also being organised by a special committee set up by the town council who have also purchased a number of Silent Soldiers showing a silhouette of a serviceman, head bowed, for various positions around the town. 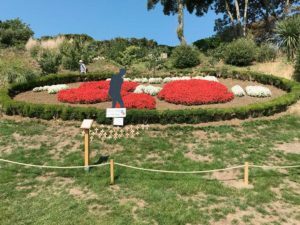 One of these is in Langmoor Gardens where the soldier is appropriately standing guard over the poppy flower bed (pictured). 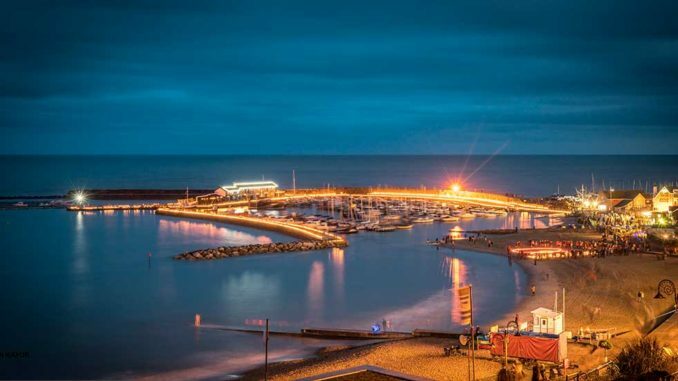 THERE has still been no public announcement on whether Lyme Regis Town Council will be taking over some of the amenities currently run by the soon-to-be defunct district council. 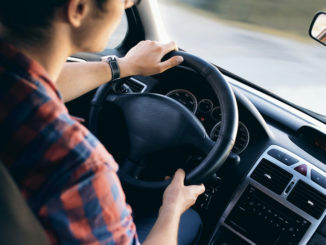 Come May of next year local government in Dorset will be going through the biggest change since 1974 when borough councils were abolished in favour of district authorities. 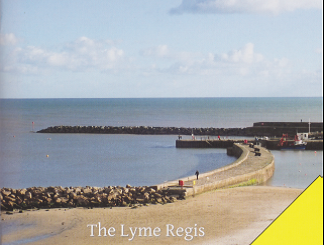 It is generally accepted that Lyme came out of that reorganisation much better than neighbouring authorities, thanks in no small measure to the town clerk of the time, Harry Williams, who sacrificed his local government career to fight tooth and nail for Lyme to keep its seafront undertakings and some car parking. So will Lyme benefit again when West Dorset District Council disappears, along with Dorset County Council, to be formed into one unitary authority, to be known just as Dorset Council? How long did they take to come to that decision? Negotiations between Lyme and West Dorset have been going on for months over what assets Lyme may end up with when WDDC is no more and what will be retained by the new Dorset Council. One job the district council has made a complete horlicks of has been the running of the public toilets in the town, once described by a visitor in the View from Lyme Regis newspaper as “the dirtiest in Europe”. The town council wrestled the seafront toilets away from the district council and have since refurbished them as a unisex facility, which seems to be working well. It was thought that Lyme might get the other toilets in town but that has not been confirmed as discussions continue. It would seem that the only other asset the town is most likely to get is the Tourist Information Centre, which makes total sense to me. And that brings me to another matter. I have spent more time in and around the seafront this summer and it appalls me that the Jubilee Pavilion information service has been abandoned. Many will recall that the fitting out of the pavilion was organised by Chris Boothroyd who almost single-handedly raised £200,000 to make it fit for purpose. Then he organised a group of volunteers to man the facility throughout the summer months until he was treated so appallingly by the previous council that he and most of the volunteers, me included, withdrew our services. We can’t blame the current council for this. It was their predecessors. A new town council will be elected in May and they can put this shocking waste of public money to rights. One way this could be achieved is by making the shelters information point an outreach of the TIC, especially during the summer months, or move it to the seafront completely.